The above allows the weak hypercharge and weak isospin operators to share a 2×2 matrix representation. To unify the states, we have to pass to a density matrix representation. Similarly, given a U(1) state , we can convert it into a 2×2 matrix. For qubits, such a (pure) density matrix would be boring, it would only be the unit matrix. But for wave functions that depend on position, the density matrix is not trivial and contains the relative phase information of the quantum state (which is the only phase information that is physical). But for this post, simply note that 2×2 matrices are rich enough to contain both types of quantum numbers. A density matrix is partially characterized by the fact that it is idempotent, that is, . This characterization is not complete in that the equation has other solutions, in this case , and . These other solutions have trace 0 and 2, the usual pure density matrix has trace 1. It turns out we need these other solutions so their having the wrong trace is an issue. Further down we will show how to convert the traces to 1, but for now let us postpone the discussion. So let us look for the idempotent 2×2 matrices that are eigenstates of Q. 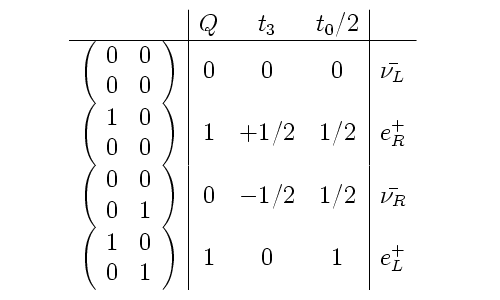 For states represented by a matrix M, “eigenstate” means double sided eigenstate: MQ = QM = qQ, where q is the electric charge of the state M.
Scaling the charges can be absorbed into the arbitrary real constant . So we will use freely instead of . This is not enough solutions to represent all the elementary fermions, but we can hope that this will get us started with the leptons. Also, note that the above are not eigenstates of and . This is a problem that we will fix when we convert them into primitive idempotents later in this post. For now, let’s just ignore that issue. And we have picked out the states for the anti-leptons. The lepton states have quantum numbers the negatives of these. We will bring the quarks into the model tomorrow or the next day. Doing this will require converting the four complex numbers in these 2×2 matrices into 3×3 1-circulant or 3×3 2-circulant matrices. The above solution for the idempotents is inadequate in that it results in solutions with trace 0, 1, 1, and 2. There is a technique for converting solutions such as this into idempotents (of a larger problem) which have trace = 1, (and which, therefore, are primitive idempotents) which we will now show. The interpretation of an idempotent with trace = k is that it is made up of k particles. For the case of spin-1/2, a pure density matrix has trace = 1 and models 1 particle, say spin-up or spin down. The 2×2 unit matrix is the sum of spin-up and spin-down and corresponds to a state where both these particles are present. It can be thought of as a bound state, for example, the two electrons in a helium atom. (Note: in the usual density matrix normalization choice, these matrices would be multiplied by 1/2 so as to keep the trace 1. But this is just a choice of normalization, the interpretation is similar.) One cannot combine two single particle states this way unless they have opposite spins, which is appropriate due to the Pauli exclusion principle. And the zero matrix corresponds to no particle at all. and it has trace = N. (Multiply it out and see!) Note that the off diagonal elements are a linear function of the U and so the transformation is 1-1. By converting all the particles into this form, we’ve replaced the problem we had before, where U had various traces, to a new problem, where all the states have the same trace. It remains to reduce this trace to 1. If N=1, then the new matrix has trace =1 and we are done. 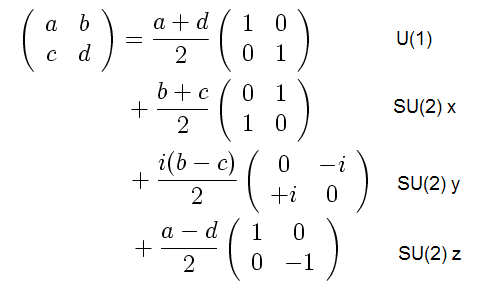 If not, then compute the products of these matrices. The products will depend on the products of the U. Some of the U will likely annihilate each other, but not all, and similarly, some of the transformed U will annihilate each other (but not necessarily the same ones as before). The products that do not give zero will have smaller trace than N. Keep all the products that are nonzero. If these have trace = 1 we are done (as will be the case for the lepton matrices described above). If their trace is still greater than 1 we multiply more of them together. This sort of process will eventually result in a set of primitive idempotents or a set of idempotents all of equal trace = M, which annihilate each other. In the first case we are done, in the second case, simply write these particles as the sum of M primitive idempotents in your favorite way and we are done. With this change, the representation of the lepton states change, but their quantum numbers stay the same. As before, we will have the anti-leptons represented as the same particles but with the negative quantum numbers. Note that the matrices on the right have trace=1 and so are primitive idempotents, as desired. As far as product content is concerned, the primitive idempotent in the right column is one of the two components to the leptons that multiply to give it in the left hand column. Also note that the four primitive idempotents in the left hand column sum to unity, and annihilate each other. That is, they are a “complete set of primitive idempotents”. Each could be written as a spinor; the set of four spinors would then be an orthonormal basis for the 4-dimensional Hilbert space. In other words, we have reduced the problem back down to the point where standard quantum field theory can deal with it; regular spinors. And this also explains how the very compact representation of the leptons found above, are not eigenstates of all at the same time; Q has priority because the primitive components share it as an eigenvalue. If we hadn’t split the representation as shown above, we’d have gotten different 4×4 matrices but their properties would have been similar. The primary reason for splitting things this way is that, when we generalize this to model the quarks, this choice will separate the 1-circulant and 2-circulant matrices which makes those (3x larger) matrices easier to deal with. Suppose we wish to define an operator that assigns the value to the kth primitive idempotent given above. Since their matrices annihilate each other, this is easy. Simply form the sum . When this sum is multiplied by the primitive idempotent , all of it will be annihilated except the part with k=j. So complete sets of primitive idempotents are convenient for defining operators; the primitive idempotents will automatically be eigenstates of an operator defined this way, with the desired eigenvalues. Furthermore, these operators are double sided, that is, the primitive idempotents will be eigenstates of the operator on either side. And from this it follows that when the primitive idempotents are split into spinors, the bra will be a left-eigenvector, while the ket will be a right-eigenvector, just as the usual quantum mechanics would desire. So primitive idempotents like these are very convenient for the primitive states. On the other hand, if we look at the non primitive idempotents that are obtained by adding the above primitive idempotents together in pairs, like the ones we used for the leptons further above, these objects will only be an eigenstate of an operator, if that operator has the same eigenvalue for all the primitive idempotents that make up the non primitive idempotent. This is similar to the case in spinors. For example, if and , then , but if the two spinors have different eigenvalues their sum will not be an eigenvector. This says that when we divide particles up into primitive idempotents as we did for the leptons, we will not necessarily be able to make them eigenstates of the same operators that worked for the primitive states. Instead, we have to create artificial operators that have the right eigenvalues. For example, suppose a composite particle is made from two primitive idempotents with eigenvalues c and d. Then the composite particle needs to have assigned to it an eigenvalue of c+d. This complication, where we had to divide the leptons up into two sub particles in order to get them into primitive form, has arisen from applying the simplest way of converting the 2×2 matrices into primitive form. It is not at all unexpected in that when you analyze the quantum numbers of the quarks and leptons from the point of view of the primitive idempotents of a Clifford algebra, the same requirement arises. In that analysis, one takes into account the quarks first, and one finds that the quarks and leptons naturally can be composed of three “snuarks” each. These snuarks are then divided into two in a manner similar to the above. The analysis using Clifford algebra is considerably more elegant in that one avoids arbitrary representations and instead deals directly with geometric objects. However, it is beyond the ability of 99% of my audience to easily comprehend as it requires learning a lot of math that the usual graduate education avoids. For those who wish to understand the subject from the geometric algebra / Clifford algebra point of view, see Chapter 6, “Measurement” of my incomplete book on modeling the standard model fermions using geometric algebra, Operator Guide to the Standard Model. Next, the quarks put into the same format. “Spin Path Integral” paper proofs sent off. Progress in Publishing the New Physics. Why does DNA only use 4 nucleotides?